Epiphone Masterbilt Zenith Classic Review – Bringing ‘30s Jazz to Life! At GuitarFella, there are not many things we love more than to see the revival of a legend – and, in the world of archtop electro-acoustics, they don’t come much more legendary than the Epiphone Zenith. This model was one of those that helped establish Epiphone as a key manufacturer in the 1930s and this modern reissue – the Masterbilt Zenith Classic – gives those of us who weren’t around in the thirties (that’s probably most of us…) a chance to relive this classic guitar. Let’s check it out. Epiphone stick to a timeless design with the Zenith Classic, taking huge inspiration from the original with both the build and the decoration. 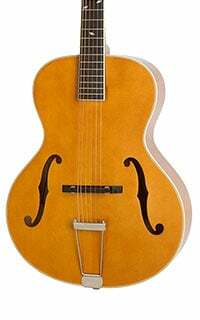 What we are presented with is a bulbous archtop body shape with a narrow 9.4” waist, featuring a solid spruce top with back and sides made from laminated flamed maple. This is all finished with an appropriate aged gloss. The face features two classic f-holes on the lower body bout, but otherwise this is a clean and simple design, with no fuss. Until you get to the neck that is… that’s where the main aesthetic draw of this beauty lies! On the ebony fretboard you’ll find 20 medium frets with unique pearloid falling snowflake inlays that really catch the eye. The retro design continues up to the distinctive dovetail headstock which is adorned with pearloid banner logos to deliver a real visual treat. Glued into the body is a five-piece neck made from alternating hard maple and mahogany, featuring a comfortable C shape. The Zenith Classic feels very well made and like a lot of love has gone into it, despite its relatively affordable price tag. It’s a guitar with huge vintage appeal, but the hardware gives you modern-day convenience and reliability. Even though it’s hard to tell when looking, the Zenith Classic is fitted with an eSonic HD preamp and Shadow NanoFlex HD undersaddle pickup, allowing for easy connections to an amp via a 1/4” jack. Controls for this are limited to just master volume and master tone, via easily-accessible dials hidden just inside the lower f-hole. This isn’t the most versatile system but doing things this way protects the guitar’s vintage look – nothing screams ‘modern’ like a preamp bolted to the side! Elsewhere, on that beautiful headstock sits a set of very good Epiphone reissue tuners with marboloid crown tuning keys, as well as an upgraded 18:1 ratio for improved tuning stability. The ebonoid floating adjustable bridge offers a compensated artificial bone saddle while it’s all held together with a retro trapeze tailpiece. With such a nice build and solid hardware, the sound was always going to be pretty great. It’s well balanced, with a sweet and rich tone that’s quite airy and resonant when played acoustically. 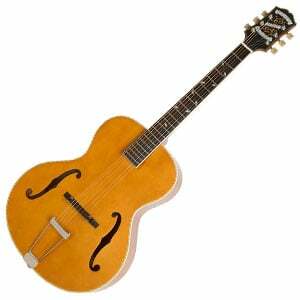 As with most archtop guitars, it lends itself very well for everything from country music to big band and jazz guitar. Plugged in, the tone does have a little of that unavoidable piezo quack, but it’s actually not bad at all and still sounds pretty natural, with a little versatility in sound shaping through the EQ controls. So yes, we are very impressed – Epiphone have once again excelled at creating a true-to-the-time vintage guitar with modern playability and reliability. The Zenith Classic is a wonderful jazz guitar for all abilities and well worth the relatively low asking price. 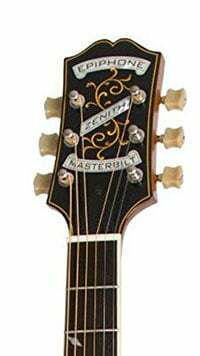 For more info about the Epiphone Masterbilt Zenith Classic, click here. For more Jazz Electric Guitar you might like, click here.